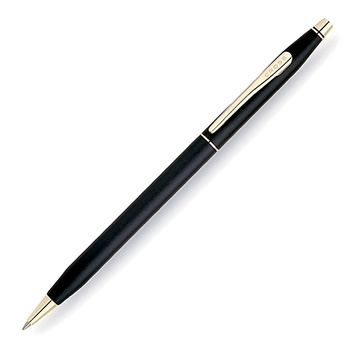 Cross Classic matte black ballpen with gold plated appointments - gift boxed. Also available in rollerball and pencil writing modes - additional charges may apply. Suitable for engraving or clip emblems - minimum order quantity applies. Unit price for plain stock: 25 units @ € 55.00 each. Prices exclude vat.